One of the biggest reasons why people do not like to go to the dentist is fear. 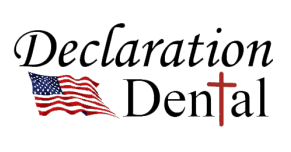 Our main goal at Declaration Dental is to make our patients feel as comfortable as possible while providing confident, quality smiles. Alongside our state of the art facility that has been compared to walking into your grandmother's home and our friendly, knowledgeable team, we are here to walk you through every step of the dentistry process. Before your first visit, we will ask you for personal data and health background information. This can be done before you set foot into our office or the day of your appointment. This general information is designed to help us complete insurance forms or other correspondence. The health information provides a baseline history to aid us in providing quality dental care for you. We will perform a thorough yet comfortable examination. Together we will discover your current conditions, needs, and desires and develop a plan that meets your goals. We allow time for any questions you may have on the state of your health and offer solutions. In the dental profession dramatic changes seem to occur regularly as new techniques and procedures are developed. Our doctors and team keep abreast of the latest techniques and extend the highest degree of professionalism. Our dedicated staff members will gladly answer your questions and customize your visit to meet your needs.